Left-Hook Lounge: Pacquiao that "Great" or Rios that "Bad"?, Is Pacquiao a Threat to Mayweather?, Froch "Gift" Victory? Left-Hook Lounge: Pacquiao that “Great” or Rios that “Bad”?, Is Pacquiao a Threat to Mayweather?, Froch “Gift” Victory? Alain B. (Cebu, Philippines): In the past you said that Pacquiao would give Mayweather a good run for him money. After seeing this performance, would you still say that he is a threat to Mayweather? Vivek W. (ESB): From day one, I’ve maintained that Pacquiao’s offense would be a great threat to Mayweather, and that his ability to pepper the opponent with power shots would be a threat to anyone in the sport, and yes….that does include Floyd Mayweather. His offense was never a question. The only question about Pacquiao was his ability to handle punches. Now that we know he can, without doubt, he remains a threat to Floyd Mayweather and everyone else. Now…..that being said…..when you peel back the layers of excitement and fanboy-isms attached to this potential showdown and see it for what it is, I don’t think anyone thinking clearly can tell me that Pacquiao is the lock to win that fight. Pacquiao went tooth and nails with Marquez so many times that here we are after four encounters, and they still have unfinished business. 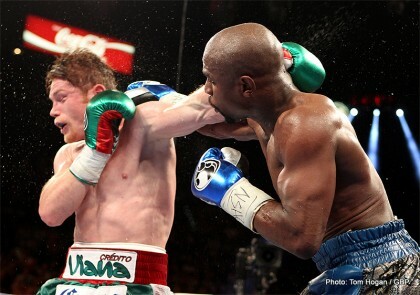 When Mayweather took a version of Marquez that many critics called a “blown up” version (at 147lbs) and shut him out. That same “blown up Marquez” stopped Pacquiao after going blood and guts in a 3rd encounter, as well. Does that mean Mayweather defeats him? Absolutely not. But does it mean that Mayweather’s immeasurable skills and incredible ring intelligence would give him an edge going in? Again, anyone thinking clearly without bias has to think so. Whatever the case, I think fans need to snap back to reality. Fans representing both sides can go on all day about who will win and why one side won’t agree to face the other, but lets look at facts: Leading up to the clash with Rios, Roach was clear in saying that they “want Marquez next”, and that they would even consider staging such a fight in Mexico. After they defeated Rios, Arum said it will be Bradley or Marquez next, and that the list stops there for opponents to face Pacquiao in his April 12th ring return. Let the records reflect – there was NO MENTION of Floyd Mayweather in those plans. So feel free to kill all discussion about what side wants what. In all fairness, Mayweather hasn’t called his name, but the reality is that he doesn’t have to. When Pacquiao was at the top, he never called opponents out. He let the men beneath him claw their way to his level. Here, I think we have to see it the same. Mayweather has no obligation to pursue Pacquiao. He has made much better money against other competitors, and has continued to dominate. Pacquiao has one victory in the past two years, and hasn’t been on a comparable level since slightly prior to that. The negotiations remain an intricate part of this process. I don’t know who would win in the ring, but I can tell you without doubt who will win at that table. Mayweather owns all the chips, and he will play his hand identically to every other cashcow, to include Pacqiuao, in the past. He could conceivably stipulate a 65-35 purse, and there’s nothing anyone can do to protest it. He has earned that right. Ideally, Top Rank would make a push to make this fight happen now, as all the other potential opponents on the table will make for tough nights, which only weakens his position. Another subpar, or questionable outing will simply deflate his chances more. Fans of Pacquiao view this topic solely on the strength of name and fame. I remind them that this isn’t solely about who puts cheek in seats. This is about “what have you done for me lately”? And “lately”, Pacquiao doesn’t have the resume to earn a comparable position. (I hope we can agree on that much). This solid victory over Rios will be the best momentum he can have going into a Mayweather clash, short of stopping Bradley or Marquez. And even that would fall short of netting him an equal split at the table. So, rather than defending Top Ranks position for not pursing this fight now, I’d advise Pacquiao fans to put pressure on them to do so. There’s no better time than the present. And there’s no way to regain fame from the past. The time is NOW!….or never! Hansel N. (Reseda, CA): I saw your Facebook post about Pacquiao and would like you to elaborate (about his performance). Would you say he is still elite? Or would you say Rios is just that bad? Vivek W. (ESB): First things first, I would like to congratulate Pacquiao and his team on their performance. This entire fight camp came surrounded with questions, as no one knew precisely what to expect going in. My personal hesitation all stemmed around his ability to handle punishment. All things being equal, I felt this would be Pacquiao’s fight to lose, as Rios – on his best day – is simply not a comparable talent to Pacquiao. But still the question remained. Could he take a flush shot? Could he take a series of flush shots? Would he hold up over the course of 12 rounds in the midst of a vintage ‘stalk-til-they-can’t-walk’ type fighter? In the aftermath, I think we can collectively agree that Pacquiao still has an adequate amount of octane in the tank, but how far it will take him in the end remains a question. Prior to him being stopped by Marquez, Pacquiao was an elite fighter in the sport. And even after the KO, I think you have to acknowledge that his offense was easily a top 3 talent in the world. That was never a question. In the fight with Rios, we saw that his offense is still very serviceable, although one could argue with great success that his power is not quite the same. I won’t openly entertain why that may be, but clearly, the shots he landed flush against Rios left many in the past starring at the ceiling of the MGM. For whatever reason, he failed to floor, or even truly hurt Rios. That said something to me. Because his power was his claim to fame, and less of it on the elite level could be a deciding factor in how his fights on that level end, going forward. Aside from the slightly less threatening power, the only other critique I have with his offense is the fact that his passion to just flat out devour the opponent didn’t quite seem the same. Some have tried to write it off and say that he’s “more compassionate after being KO’d”. I don’t support or subscribe to that theory. I don’t know if it was his energy level, or simply basic age combined with wear and tear, but he didn’t seem to be the menacing fighter that made me fall in love with his ruthless nature. He simply beat a man to the punch for 12rds whom he was notably much faster than. On the defensive side, I think we saw an evolution in Pacquiao that I welcome, and one that I think will help preserve him in the sport. He seemed a bit more dedicated to defense and many of the shots he took before, this time around, he wasn’t there for. It was hard to formulate a clear gauge, in the sense that we didn’t see nearly as much offense from Rios as we have in the past. Rios used the increase in weight as an invitation to eat more and pack on the pounds, entering the ring heavier than he ever has in the past (159lbs). Had he and Garcia been thinking clearly, they would have known that you attack speed with speed. You don’t beat speed with size. But you can beat size with speed. Speed is the great neutralizer, and for Rios’ size, speed seemed to reaffirm this position. Rios appeared slow, sluggish, and was simply outclassed as a result. I won’t say that Rios was “that bad”; but I will say that the addition of Alex Ariza seemed to hold little weight, and I’d be surprise if he’s invited to return. Rios will be fine. I expect to see him matched up with Provodnikov next, which in my mind is another loss waiting to happen. In the end, I don’t think Rios is as bad as he looked…..and I don’t totally know if Pacquiao is as good as he looked. I say that on the strength of the fact that Rios, like Margarito, is there to be hit. The truth about Pacquiao’s greatness (at this stage in his career) will remain a question until he faces a fighter that’s durable, with enough speed to catch him, and enough elusiveness to make him miss and make him pay. It’s clear that he’s still good enough to handle the B-side list of today. But Bradley, Marquez, and Mayweather each have different attributes that would test him far more than Rios. Bradley can’t hurt him, but if Rios hit him with a few shots that “hurt [him] bad”, Marquez and/or Mayweather will definitely test him further and answer more questions. Stay tuned. Greg O. (London, UK): I was very disappointed at the way the Froch/Groves fight ended. What did you make of the fight and the way it ended? Vivek W. (ESB): As a big Froch fan in the past, I’d be the first to say that the victory he received was not totally a victory that he earned. I had a major problem with the way it was stopped, and I don’t think it’s a far-fetched notion to demand a rematch. At this point in his career, I was a bit curious to know what Froch would do against a young and hungry stud. I wouldn’t say Froch fought a bad fight, but clearly he faced a young lion who showed just as much hunger, just as much ability, and just as much passion to find victory. I hadn’t really viewed Groves as a true threat coming into the bout. On the flipside, I think it’s safe to say he earned a new fan. I absolutely loved the way he handled his business in the ring against a veteran that has left many others searching for answers after the final bell. In a long term projection, I think the writing is on the wall for Froch. He can still perform adequately enough to earn himself a victory against some of the other aging vets, or perhaps a few of the ‘green’ rookies out there. But I think his tenure as an elite Super Middleweight is slowly coming to an end. Stamina and execution have begun to fade a little, replaced by slowing reflexes and simply put…..age. The calls for a rematch with Ward have fallen upon deaf ears, and technically, there’s no need for it. Ward isn’t going overseas, and there was no dispute in the decision, which means there’s no reason for him to go. On a personal level, Froch lost a fan in me because of his ignorance (for lack of better terms) and arrogance in handling the situation. Stating that the referee “saved Groves career by stopping the fight” was an absolute joke. In his heart, Froch has to know that this fight was very close to falling in the hands of his opponent, and a rematch won’t be any easier. I do hope that they make it happen, as both men deserve the right to cement the results they felt would have been inevitable in the end. We’ll have to stay tuned to see what happens, but for Froch, I don’t see many other options. Judging by the chitter chatter on the streets, I’m not the only one growing tired of his pitch. Stay tuned. (Vivek “Vito” Wallace can be heard every Tuesday night on “Left-Hook Lounge Radio” at 9ET/6PT, as well as on “FIGHT TALK LIVE”, which is a live visual broadcast, similar to ESPN’s “AROUND THE HORN”, where Vito and the gang address mailbag questions and talk Boxing. He can also be reached at Twitter (@vivekwallace747), Instagram (ViveksView), and Facebook). You are here: Home / Boxing News / Left-Hook Lounge: Pacquiao that “Great” or Rios that “Bad”?, Is Pacquiao a Threat to Mayweather?, Froch “Gift” Victory?